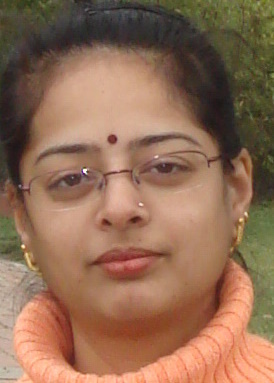 Meet Madhuram from Eggless Cooking blog this week in the Super blogger sunday series. 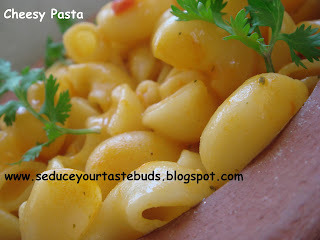 Her blog is one of the best blogs dedicated to eggless recipes. There is also important information related to egg substitutes, vegan recipes, healthy baking and so on..The amazing collection of recipes is a treat to every reader's eyes..go ahead and read more about Madhuram and her blog. EC: Tell us something about yourself. Who and what inspired you to start food blogging ? Madhuram: My blog will turn 2 in another 3 months. Wow! I can't believe it myself. It all started like an hobby but it's more than that now. I got interested in baking after watching all the Food TV shows religiously. Being a vegetarian I was not comfortable bringing eggs home (though we eat store bought baked goods made with eggs). So I started looking for egg free baking recipes and stumbled upon Indira's Banana-Carrot Cake recipe. That was the first egg free baking recipe I ever tried and it came out very well. It was so good that I used to avoid eating bananas and let them over-ripe purposely just to make the cake. 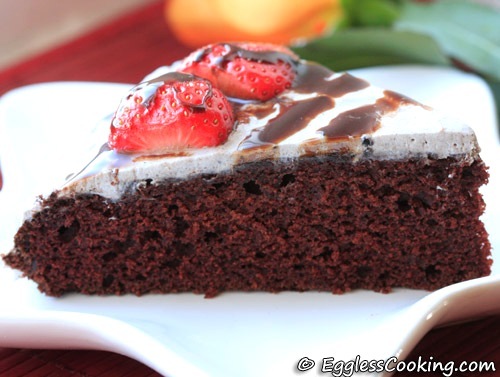 Then I started visiting blogs from her blog list and came across a lot of eggless baking recipes in those blogs too. I began to bookmark them and the list was getting out of control and that's when I told my husband that I too wanted to start a blog just to create a directory of eggless baking recipes. At that time I didn't even have the slightest clue that I would be baking so much. The idea behind my blog was just to put all the links under one roof. Before blogging became an inevitable part of my life, I have often wondered what was I doing with my life. I was of course happily married and a stay at home mom of a toddler son. Often times I felt that I was wasting my time, I wanted to do something, but I didn't know what "that something" was. Now after a year and 9 months later, with my husband's tremendous technical and moral support, my blogging friends' and visitors' encouragment and appreciation I'm very happy that I'm doing something worthwhile. Madhuram: I too am a novice. I have always had interest in cake decorating but until recently I did not get the chance to join the Wilton's Cake Decorating courses. It's a 4 part series covering the basics to some extent of advanced cake decorating techniques. There are a lot of videos on YouTube for cake decorating, but I would definitely suggest taking the course. It is really very helpful. EC: Have your recipes been copied anywhere without your permission..How would you deal with plagiarism ?? Madhuram: Yes a couple of times. It was not by fellow bloggers but by these crooked/smart people who sort of got RSS feeds from my blog and updated theirs with my content as and when I posted. My husband took care of it by calling our web host and blocked their IP address. EC: What are your sources for recipes ? Do you follow them as given or make changes to suit your taste buds? Madhuram: Initially I was following baking recipes (from books/websites) to the T. I always mention the source of the recipe if it is not mine. Now with little experience I'm making a lot of changes and substitutions to the original recipe and sometimes come up with baking recipes of my own. 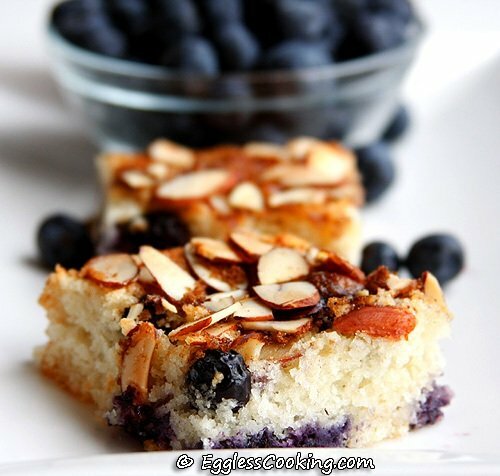 EC: If you were to suggest one of your recipes for a first time baker, which would it be and why ? Madhuram: I'm having a hard time to choose between these 2 because both are very easy to bake and very tasty too. I learnt this from one of my gujrathi frend at the temple where we used to go do seva. Soak chana dal and urad dal for 8 hours. Grind finely. Mix ginger and green chilli paste to the dal paste. Add soda bicarb, asafoetida, salt and sugar. Heat two tbsps ghee and pour into the dal mixture. Put the mixture in a vessel. Cover and leave overnight. Add the juice of two lemons in the morning. Spread the mixture in a greased thali or pan and steam cook. When dhokla is ready, test by piercing with a knife. It should come out clean. Remove and cool. Cut into squares. To season, heat remaining ghee, add mustard seeds, a pinch of asafoetida and curry leaves. 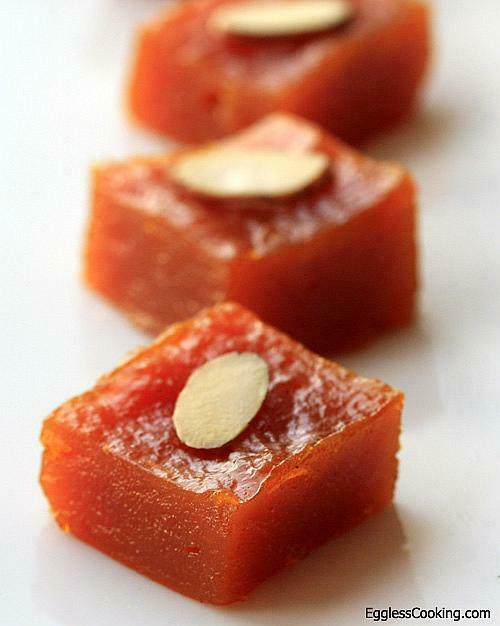 When they pop, pour over the dhoklas. Garnish with grated coconut and green coriander leaves and serve. This curry can be made either with black beans or black eyed beans. Soak the beans for atleast 8-10 hrs. Pressure cook the beans. Make a paste of tomato, ginger, green chilli and coriander leaves. Heat 1 tbsp of oil, add 1 tsp of cumin seeds. Once the seeds get fried well and a nice aroma comes out, add the tomato, ginger, chilli and coriander leaves paste. Fry the paste for sometime till the paste is cooked. Once the paste is cooked, add the turmeric, red chilli powder, coriander powder, cumin seeds powder and garam masala. Once the masalas are cooked, add the cooked beans and salt, mix well and boil for 5 min. 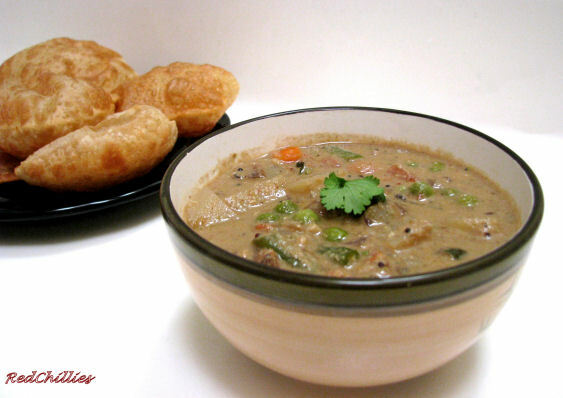 This dish is now ready to serve with bread or chapatis. As I do not eat garlic and onions, I asked my mother in law to try adding onion and garlic to the masala paste. That is she made a paste of onion, tomato, ginger, green chilly, garlic and coriander leaves and she said that it tastes really great. So its for those who eat onion and garlic go ahead and try it. This kheer is my favroite sweet. Its so easy to make. I really love to make and eat it. Dry roast the moong dal till it is brown in colour and the raw smell goes away and a nice aroma comes out. Now pressure cook the dal with 2 cups of water. The dal needs to be little mashy. Now add the coconut milk and jaggery to the mashed dal and boil it for sometime. Do not cook for more time. Add the elaichi powder, dry fruits and mix well. Serve hot. This kheer becomes a little thick after cooled. This week meet Sanjana from KO Rasoi. She appears to focus on vegan food, eggless baking and most importantly shares the secret of Gujarati cuisine..Check her blog for all these and more..
Soak channa dal for about 8-10 hrs. Soak the sabudana. Pressure cook the channa dal. Mix the channa dal, jaggery, sabudana and coconut milk and boil for sometime. Do not overcook as when it cools it becomes very thick. Add elaichi powder, dry fruits and serve hot. I learnt this dosa from my mom she makes it really good. I have tried it and it comes out very good. Everyone should try this healthy recipe. Soak all the dals together and rice separately for atleast 8-12 hours. Then grind the dals and rice separately to a smooth paste. Mix the rice and dal pastes and let the paste ferment overnight. Heat a tbsp of oil in a pan, add cumin seeds, ginger and green chillies. 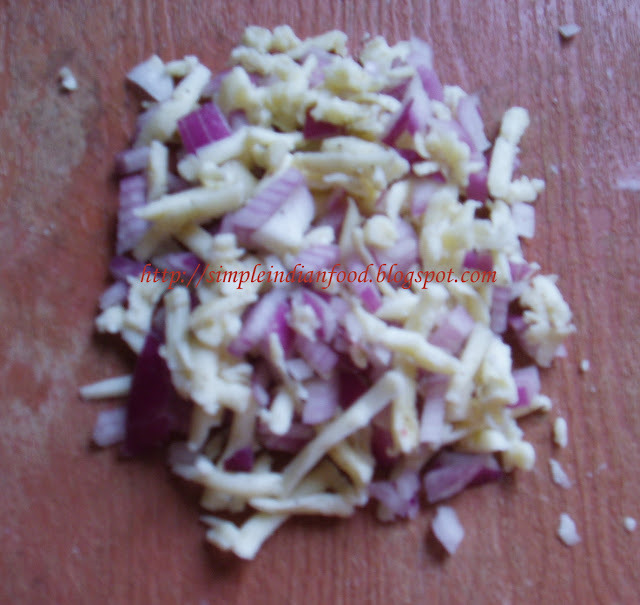 Fry these ingredients and add it to the fermented mixture. Add salt and mix the batter well. Heat a tava or a heavy griddle, spread some oil. Take a ladle full of the dosa batter and pour onto it. Spread it in a circular motion to make it as thin as possible. Pour a little oil around the dosa and on it. 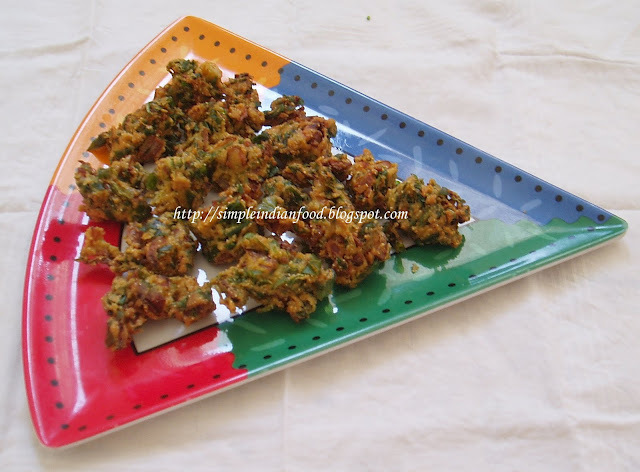 Once it is cooked crisp on one side, flip it over for few seconds and serve hot with sambar and coconut chutney. Pressure cook the toor dal with the tomato and the coriander sticks. Once they are cooked, just grind them in the mixie. After the dal, tomato and the sticks are blended well, just take it out and boil the mixture by adding salt, pinch of turmeric and red chilli powder. Temper the dal mixture using 1 tbsp of ghee, mustard seeds and add pinch of asafoetedia. Now the dal is ready to be served with rice. I think garlic can be used in this dal while tempering, may be it will taste good. I think who eat garlic can try using and let me too know how it exactly tastes. But without garlic it tastes delicious. 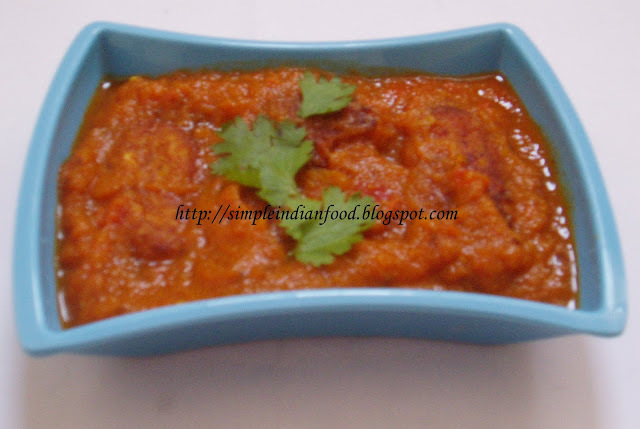 This curry can be made either with moong / green channa or whole masoor. This curry is really the heaven of goa and best i can think of when i m really really hungry. This curry does not need sprouted beans. Soak the masoor or green channa or green moong overnight and Pressure cook the beans. Heat 1 tbsp of oil and fry the cumin/coriander seeds till they are light brown, then remove them. In the similar way fry the cloves, cinamon and peppercorns. Lightly fry the red chillies. Finally in the remaining oil roast the scraped coconut till it is brown. Mix the roasted coconut, fried spices, red chillies, red chilly powder, turmeric and tamarind and grind it to a smooth paste. In the mean time put some water in the cooked beans and boil it for 5 min. Add the ground paste to the beans and add salt and sugar as per taste. Boil it for a while and add coriander leaves. Serve hot with chapati or rice. Onion can be used in this curry and it becomes good too. So while using onion just fry the onion in the oil till it is golden brown and grind it with the coconut, spices paste. One day it was a rainy night and I saw some green moong soaked. Didnt know what to do, so decided to try out something new and guess what the trial was something really good, tasty and healthy. Soak the moong beans overnight and pressure cook the beans. Heat 1 tsp of oil, add the cumin seeds when the seeds crackle, add asoefotedia. Then add the green chillies and crushed ginger once the chillies and ginger is nicely fried in the oil. Add the pressured cooked moong beans and add water as much as you want. Add coriander leaves and salt and let the soup boil for a while. Serve hot with rice or it tastes just good to have it like soup. Its always when we want a burgar we go out to food joints or get the frozen patties. I was just thinking eating deep fried patties could be unhealthy. This lead me think about these healthy patties. 1/4 cup of soya chunks soaked in water for a while. Soak the moong at least for 8 hrs. Pressure cook the beans. We will need to slightly over cook the beans as we will need to mash them. Boil or pressure cook the soya chunks. Mash the moong beans, add the mashed potato and once the soya chunks are cooked just squeeze all the water from them and mash them. Add it to the mashed moong and potato mixture. Heat 1 tbsp of oil, add cumin seeds and once they splutter add asafoetedia, green chillies, ginger. After the chillies and ginger are fried well, add the mashed mixture, garam masala and mix the masala well with the beans and the potato mixture. Add coriander leaves, lemon juice and salt. Switch off the gas. Let the mixture cool for a while. Then make burgar patties and shallow fry them by coating bread crumbs or little semolina. They could be shallow fried just without coating anything too. These patties can be used as burgar patties. Just put them in between the buns, then keep a lettuce leaf, add little tomato sauce and enjoy. Ramki: I'll let The Hindu talk on my behalf. I was running a dotcom and had to travel abroad frequently. Eating out was not always an easy option. When I started on regular recipe books, many of them had this " just do what I say" approach to cooking, which did not suit me. After botching up numerous dishes, I had an 'aha' moment when I realised that I do not need to create taste - it is inherent in the ingredients. All I needed to do was to ensure I do not spoil this inherent taste. Cooking then became fun and creative. After I managed to retire early, cooking became a full time passion and now I spend most of my time cooking, reading about different cuisines, food history , trying to deskill / demystify traditional dishes and writing One page cookbooks. Ramki: I get my kicks from getting newbies to realise that cooking can be fun & easy. All my cookbooks are aimed at people who have never cooked before. That is why there are no exact measurements or no complicated steps. Motivating newbies to start cooking was the inspiration behind one pagers. EC: How did you come up with this concept of one page cookbooks which is a boon to newbies in cooking? Ramki: I stumbled upon the fact that each cuisine has a set of key building blocks, various combinations of which give rise to innumerable recipes. For example, all the hundreds of south Indian curries are various combinations of just four building blocks - Tamarind, Tuvar dal, Yogurt and Coconut. A one page chart is all you need to show these variations. EC: How much time and efforts are involved in preparing each of the one-page cookbooks ? Ramki: Understanding what makes a recipe tick is the first step. Once I get comfortable with a recipe, I search around for the numerous variations, all of which get distilled into the One page format. Some one pagers take just a couple of days and some take weeks. EC: Among all your one-page cookbooks which is your personal favourite and why? I'm still delighted that the vast myriad of indian curries and Chaats can be captured in a single page ! Ramki: When One pagers became popular, critics accused me of oversimplifying recipes. A demo was the best way to answer them. I also wanted to prove to myself that these indeed work, even on a large scale. This was an idiotic thing to do, as a lot of things could have gone wrong, I never have cooked for a crowd larger than 20 and I grossly underestimated the difficulty n handling super sized equipment. Starting from scratch was another blunder as I had to chop up mountains of vegetables - I could have easily injured myself and that could have brought the event to an inglorious halt. But thankfully, with a good dose of luck, I was able to pull it off ! Ramki: I guess the format protects the recipes. So thankfully I have not experienced plagiarism till now. I guess lodging a protest to all concerned authorities as soon as possible is still the best response. Ramki: 1001 Rotis is my favourite recipe list. So easy to make and infinitely variable, I think these will delight us for ever ! Heat oil, add mustard seeds, blackgram dal and bengalgram dal. When it splutters, add curry leaves and chopped methi. Sprinkle some water and cook the methi. When done, add cooked carrot, salt and vangi bhath powder. Mix well till dry. My specialty is cuisine from Kerala, but I also try other cuisine. I love to try new and tasty food. Please visit my blog and give valuable suggestions and comments. Heat oil, add mustard seeds, bengalgram dal and blackgram dal. When it splutters, add curry leaves, asafoetida and tamarind juice. Add turmeric powder and boil for few minutes. Add sambar water, salt and 2 more cups of water and allow it to boil for some time. When a bit thick, add the fried appalam broken into uneven pieces. Optional- Can add some onions also before adding tamarind extract and fry for a minute. Mix all ingredients except oil. Heat oil in a kadai. 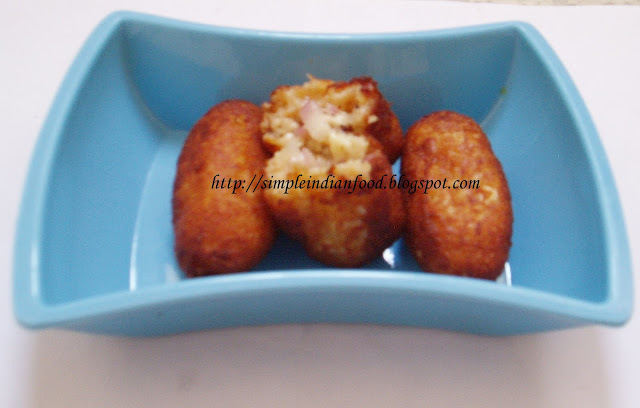 Make balls of the batter and flatten them to give them the vada shape. Deep fry in hot oil till golden brown and cooked. Remember to cook on low to medium flame so that the batter is well cooked inside. In case the batter is loose and you are unable to make vadas, just add a little rice flour to it and mix before making vadas. Add turmeric powder, garam masala powder and red chilli powder to the idli batter and keep aside. Remove the skin of the cooked colacasia and cut into small rounds. Dip it in the idli batter and deep fry till golden brown. Drain excess oil on a tissue paper. Mix all the ingredients except oil by sprinkling some water. Heat oil and put in small pieces of the mixture and fry till golden brown and crisp. Serve hot with tomato ketchup/sweet chutney. P.S. When you use methi, remember to chop it only just before you mix it with the flours..else it will turn out to be bitter. Heat oil, add cumin seeds. When it splutters, add the onion and tomato puree and cook for 2-3 mins. Add turmeric powder, red chilli powder, garam masala powder, salt, sugar and stir it well. Add water as required for gravy and allow it to come to a boil. Add the cooked peas and cream. Mix well. In a word, a Certified-Foodloving-Flexatarian who spent entire childhood and early-teen days in TamilNadu and late-teens->youth->adult transformation happened in the US which makes me an AGCD(American Grown Clear-minded Desi). I am also a proud mom of a 2-year old boy who has taught me to be a little more patient, a lot more loving, a little less snappy and a lot less lazy. So it is really true when they say "Having a baby changes everything". 2.Live, to tell my tale and to travel, my second passion, yea! 'Pan Gravy Kadai Curry' is the name I came up for the blog since I will be posting both eastern and western recipes. PanGravy->West and KadaiCurry->East. Get it? Why the nickname 'Cool Lassi(e)'? Like how most writers have a pen-name, I thought I should have a blog-name. I wanted to call myself Mango Lassi(e) due to my unwavering love for the drink but ended up with Cool Lassi(e) instead.The name can be perceived either as a cool drink or a cool girl. You Call. LoL. For a long version of the same, click here.